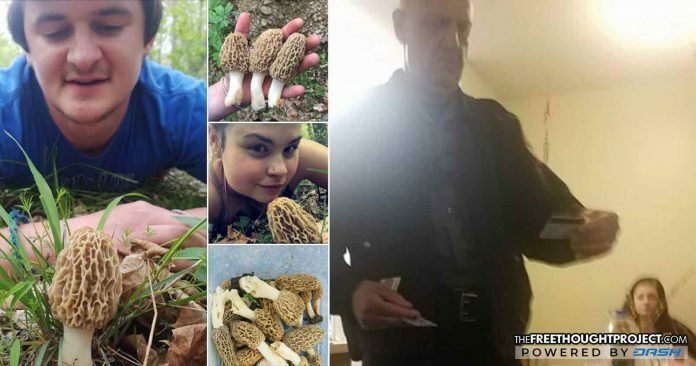 Only hours after posting a photo of the morel mushrooms they found foraging earlier in the day, a couple was raided by police who thought they caught a pack of hardened criminals who'd dare to expand their minds—but they were wrong. Darlington, MD — It is a travesty enough when the drug war lays waste to the rights and lives of entirely decent people who’ve harmed no one simply because they choose to ingest a substance deemed illegal by the state. However, because the drug war is such an immoral and barbaric practice, entirely innocent people are also swept up in the dragnet of tyranny and ignorance. 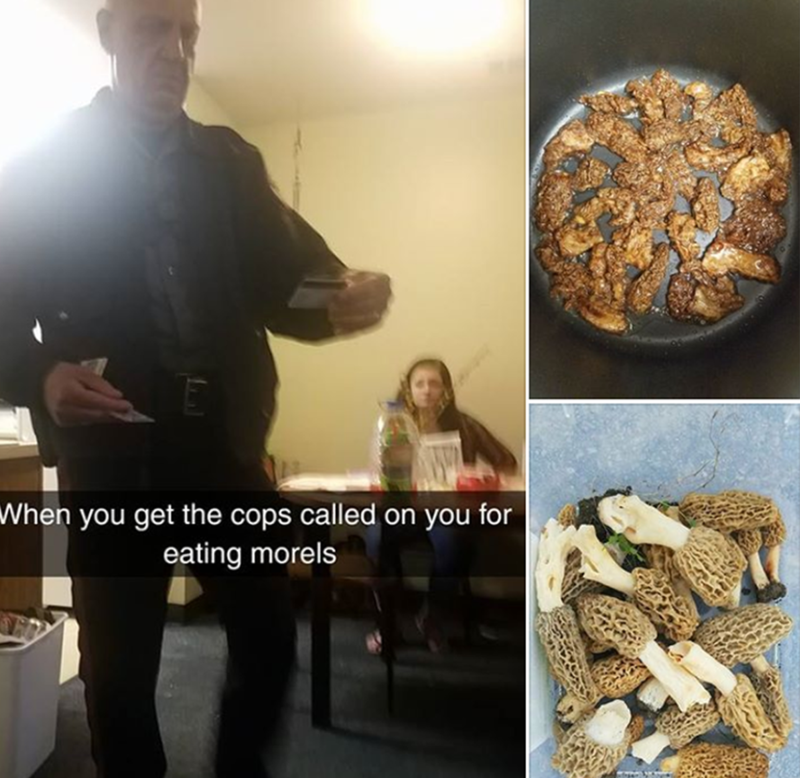 Case in point: a couple in Maryland were raided by cops for posting photos of legal morel mushrooms they picked and ate. 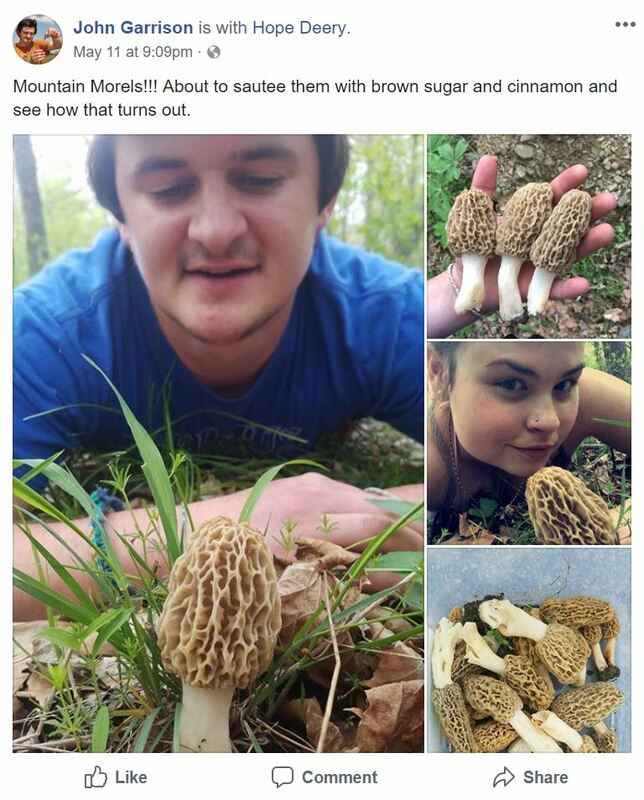 On Friday, John Garrison and his girlfriend Hope went foraging the mountains for some morel mushrooms. Morels are known to those in the region as being the safest mushroom to hunt for as they are very easily identified due to their unique look. From mid April to mid May, lovers of nature and good food, like John and Hope will find them growing near trees or where there used to be trees. A great night of good food was set to follow an awesome day of hiking and foraging. That is, however, until the wheels of the police state drug war caught a whiff of the mushrooms. Garrison made the post that they were about to saute the mushrooms at 9:09 pm. Only hours later as he and Hope sat back with full bellies, police showed up. “We had just finished eating the Morels we found today and heard a knock on the door. A police officer and an RA were standing outside. We let them in and as soon as the police officer walked in he asked us why we were eating mushrooms and posting about it online. He thought he was on the biggest bust of his career thinking we were having a magic mushroom party before I explained to him that Morels are a native choice edible mushroom similar to truffles,” explained Garrison. However, this cop—clearly unaware of the tasty morel and hell bent on busting kids for eating mushrooms—just knew he had caught himself a pair of hardened criminals who’d dare to expand their consciousness in the sanctity of their own home. “He wasn’t convinced. So I rummaged through the trash to find a peice (sic) of a Morel so that he would have evidence that we weren’t taking psychedelic mushrooms. I showed him and he still wasn’t convinced that they weren’t magic mushrooms, Which was shocking to me because morels look nothing like a psychedelic psilocybin (sic) mushrooms and I figured a police officer would know what illegal drugs looked like. A second police officer showed up and I showed her the Morel and she immediately knew it was a Morel which was a relief. They processed our ID’s and eventually left. What an experience,” Garrison wrote on Facebook. Indeed, it was a troublesome experience and, had anything made police fear for their lives during this interaction, things could have turned out a lot worse. Equally as troubling as cops raiding your apartment over Facebook posts for legal mushrooms is how they found out about it in the first place. Were police simply trolling Facebook that night and saw Garrison’s post? Or, did some “good citizen” do their due diligence and “see something and say something”? Either way, both of those scenarios are undesirable and facilitated by the state’s immoral and violent drug war. Until the dinosaurs in the prison industrial complex—who keep the drug war alive to reap massive profits off of persecuting people for victimless crimes—are exposed, this madness will continue and others will not be as lucky as John and Hope.